“Radical Decency” might be a fancy new name for the old-timey philosophy governing Bridge of Spies, Steven Spielberg’s earnest, burnished, thoroughly gripping account of a notable episode of Cold War diplomacy. Compressing events that unfolded between 1957 and 1962, the film is primarily about the relationship between Manhattan insurance lawyer James B. Donovan and Rudolf Abel, née Col. Vilyam Genrikhovich Fisher, the Soviet spy he was court-appointed to represent. Though reluctant to accept Abel’s case, Donovan defends his client with more zeal than anybody, including the judge, wants, on the grounds that it’s the only way to show the world that innocent-until-proven-guilty American justice is superior to its totalitarian Soviet counterpart. Though unable to persuade a jury of Abel’s innocence, Donovan convinces the judge to spare his life—leaving the U.S. with a bargaining chip when C.I.A. pilot Francis Gary Powers’ top-secret U-2 spyplane is shot down over Soviet territory and Powers is captured three years later. Appreciating that Donovan foresaw the need for a captive to trade, the C.I.A. dispatches him to freshly walled-off East Berlin to try to negotiate Powers’ release in exchange for Abel. Of course, because Donovan is played by Tom Hanks—the humble star who embodies the ideal of American fair play onscreen like no one since Henry Fonda—you know he’s going to exceed his mandate: He tries to get an American economics student trapped behind the just-erected Berlin Wall freed, too. And yet this flourish, like so much of what seems in the script (which Joel and Ethan Coen punched up for British playwright Matt Charman) like Hollywood invention, is based in fact. The role of Donovan, who served as a prosecutor at the Nuremberg trials, fits Hanks like one of the Mr. Rogers cardigans he slips over his shirt and tie when it’s time to kick back. And if the movie isn’t quite as as rewarding as his and Spielberg’s previous collaborations—lacking the concussive force of Saving Private Ryan or effervescent pleasure of Catch Me If You Can—well, that’s an awfully high bar. The most memorable performance comes from Mark Rylance, the Olivier Award-winning actor/director/playwright who plays Abel. Rylance makes him a stoic man of honor. So too are his Yankee captors, who accept his refusal to cooperate during interrogation without subjecting him to the torture to which Powers is shown to endure: Sleep deprivation, having buckets of water thrown on him. For what it’s worth, a National Air and Space Museum curator I spoke to who has studied the Powers incident extensively found this element overblown; she says the Soviet Union was just as invested in having the world see it was treating its prisoner decently as the U.S. was. Powers “secret journal,” which he supposedly smuggled out of captivity inside the rug he knitted while a prisoner, is on display at the Museum. To my untrained eyes, it looks way too big to have been concealed, but what do I know? Also, the movie gives the impression Powers was a novice U-2 “driver” when he was shot down; in fact the May 1, 1960 U-2 mission that ended in Powers’ capture was his twenty-eighth He was the most seasoned U-2 pilot in the program. Donovan becomes a figure of suspicion and even loathing for taking his mission to defend Abel seriously. “Everyone will hate me but at least I’ll lose,” he predicts. The movie appropriately abstains from the quirky, quotable dialogue the Coens’ write for their own movies, but it still gets in a good verbal lick here and there. And the film’s marvelous opening sequence, depicting Abel’s arrest in the Brooklyn apartment he shares with his paintings and a stack of radios, has almost no dialogue at all. Donovan’s mission to East Berlin, where the wall is just being erected, feels tense and frightening. One scene, wherein he fears he will be late for a critical embassy meeting because he underestimated how long he would have to stand in line at Checkpoint Charlie, is more suspenseful than any scene about standing in a line has any right to be. Spielberg’s instincts err only in the film’s final moments. Like every “serious” Spielberg picture going back at least as far as Saving Private Ryan 17 years ago, Bridge of Spies has a clunky scene at the end that restates the theme of the movie for anyone who’s spent the prior 130 minutes dozing. This one is even more egregious than Private Ryan’s present-day coda, because it contradicts the message of a stronger scene from only moments earlier, wherein Donovan reassures Powers, “It doesn’t matter what anyone thinks. You know what you did.” Plus it just plain feels fake: Why would the CIA choose to publicize Donovan’s role in negotiating the exchange, allowing his name to be mentioned on TV while his adoring children and skeptical wife (the marvelous Amy Ryan, lacking very much to do) happen to be watching? The White House announcement said that efforts to obtain Mr. Powers’ release had been under way for some time. It added that the United States, in its recent efforts, had had the “cooperation and assistance” of James B. Donovan, a New York lawyer. That’s paragraph five of Tom Wicker’s Feb. 11, 1962 New York Times story about the prisoner exchange. Truth is sometimes hackier than fiction. 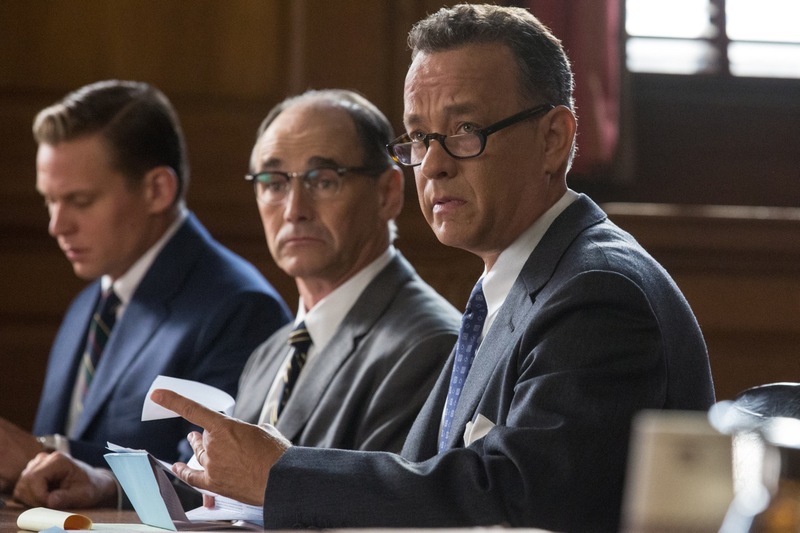 Bridge of Spies, like the quiet peacemaker at its center, is savvy and smart. It speaks softly but carries a big briefcase. This entry was posted in movies and tagged Cold War, film reviews, Francis Gary Powers, Mark Rylance, Steven Spielberg, The Coen Brothers, Tom Hanks, U-2. Bookmark the permalink.